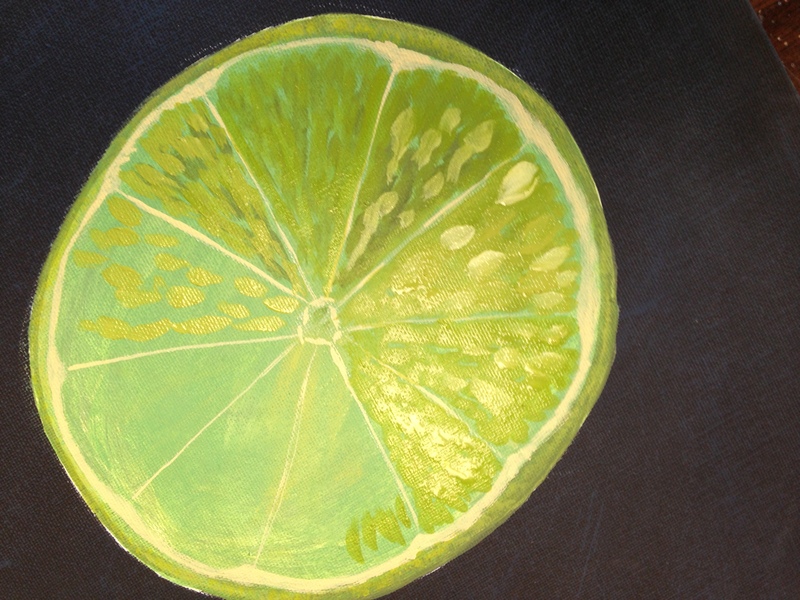 This is a third painting in my cocktail condiment series! 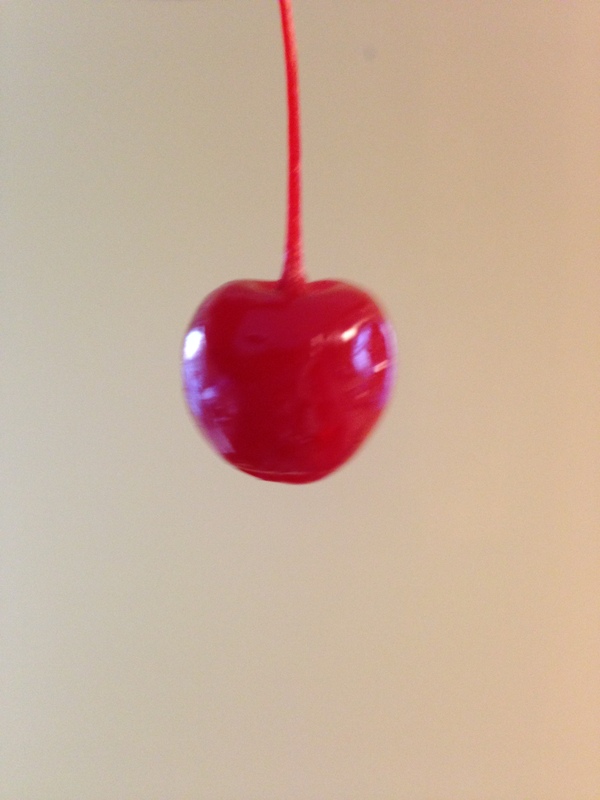 Cheery cherries! Makes me want a cocktail. 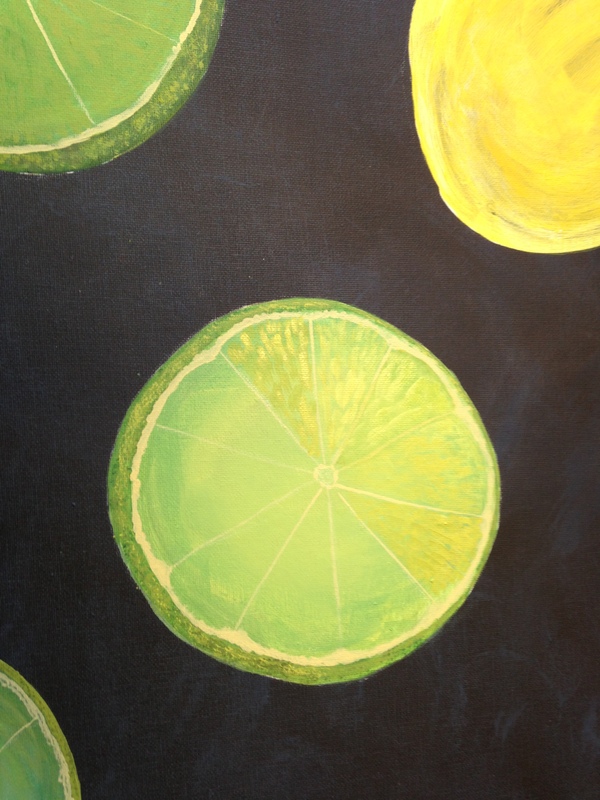 Like the olives and citrus slices , this was done in acrylic on board 24″x36″. All three are now available as a blank note card. $3.00 each. Contact me if interested in cards or this available painting. This was the inspiration! Juicy, deliciousness!! Another view of Poco’s in Portsmouth. I’m obsessed with storefronts and old buildings especially with nice old brick with patina. Portsmouth has brick everywhere. I added the folding chair. Maybe a bouncer sits there, or me waiting to get a table! 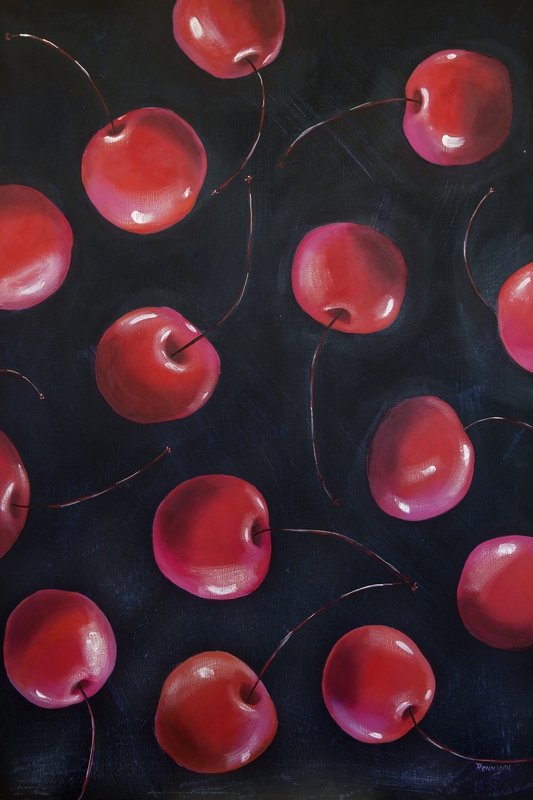 This is a working title for this latest painting done in acrylic. Not sure the title is going to stick but it’s a good start. This is another Portsmouth store front. 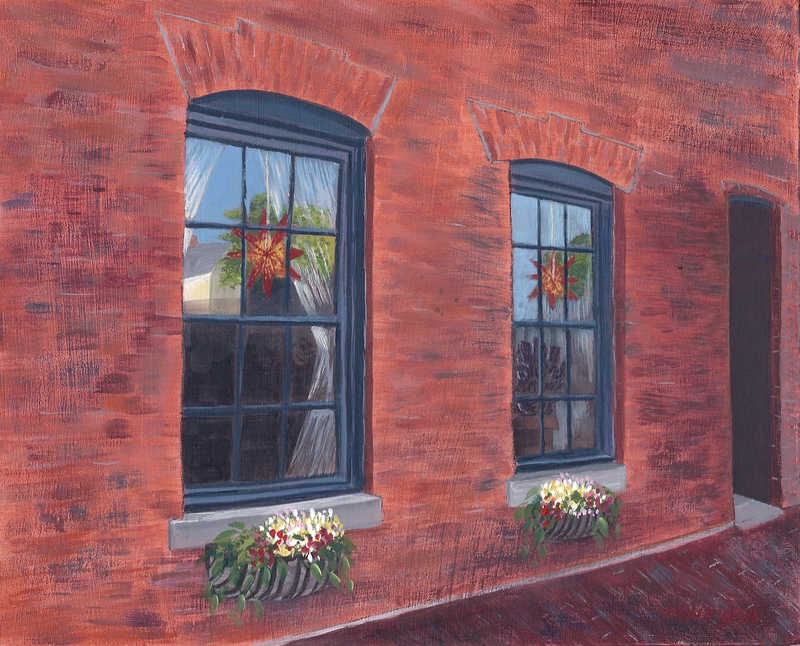 It is actually a restaurant named Poco’s Bow Street Cantina in a beautiful old brick building. 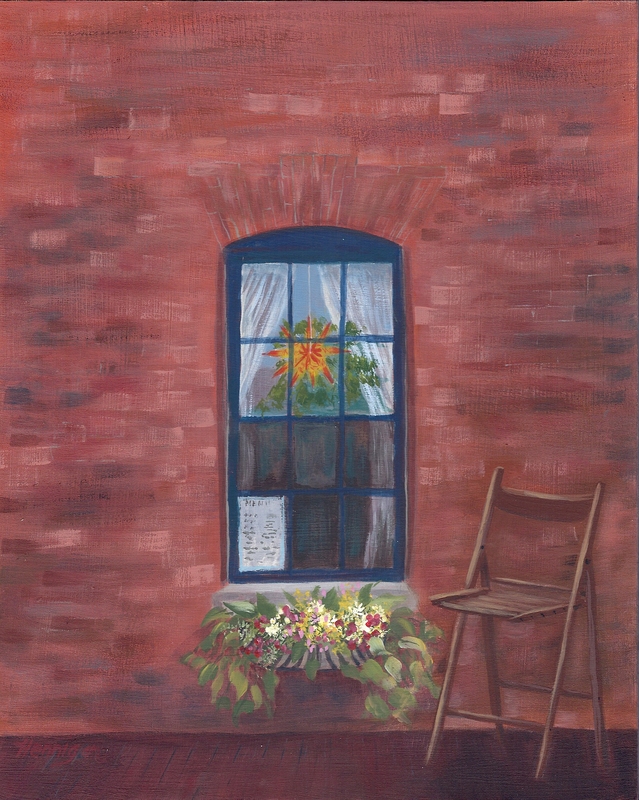 Between the old brick, the pediments, and the hanging starlights in the window I was intrigued. I decided to make another painting a la Olive Progression and wanted to do something fun that wasn’t exactly the same repeated image. 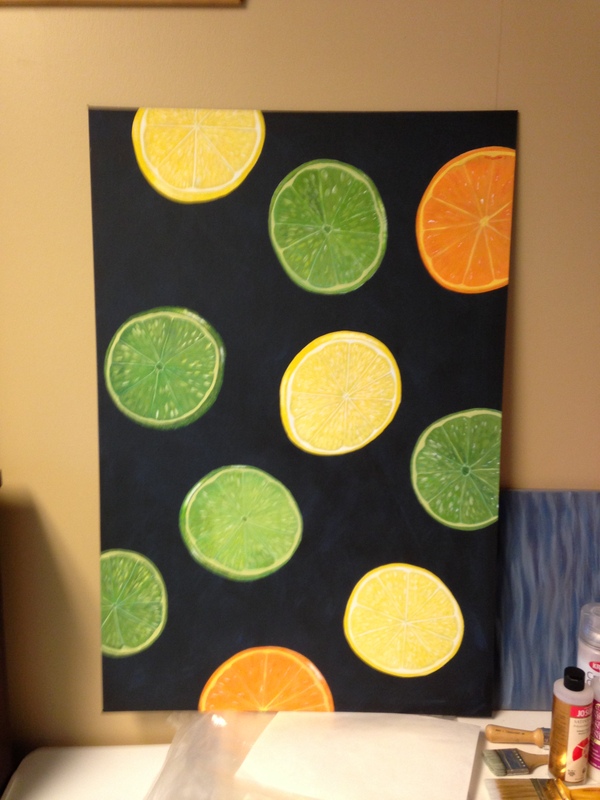 I chose to go with slices of citrus fruits – lime, lemon, and orange – for a colorful palette with a little more detail. Step 2 – Placement design. 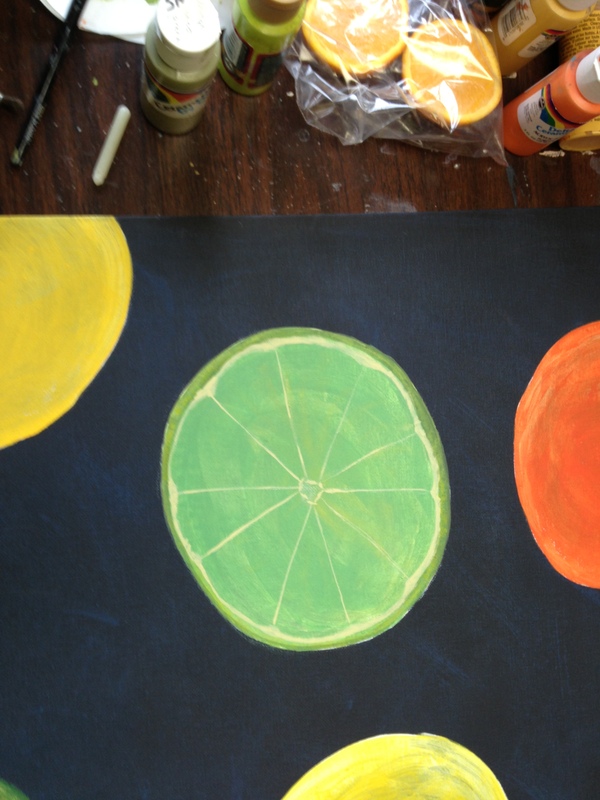 Cutouts of the slices help give me an idea of where to place each colored fruit. 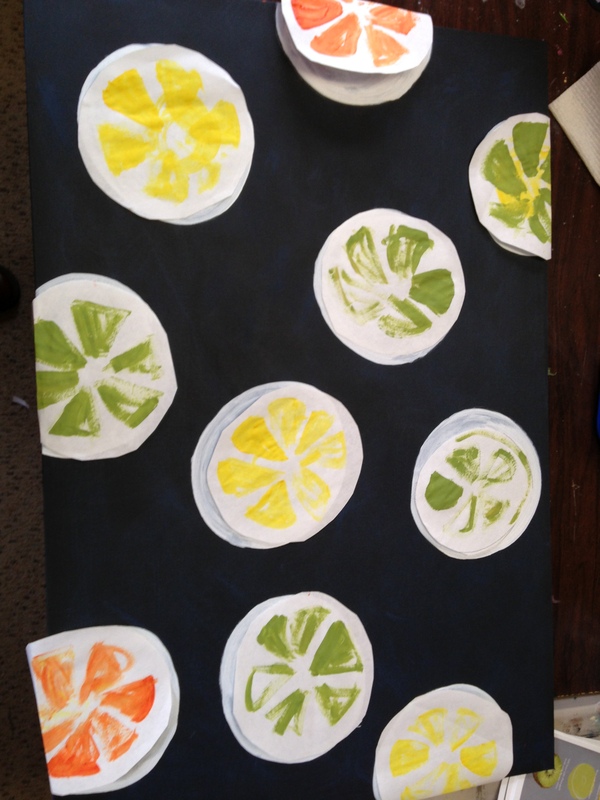 Step 3 – Let the painting begin! Base coat colors for the slices. 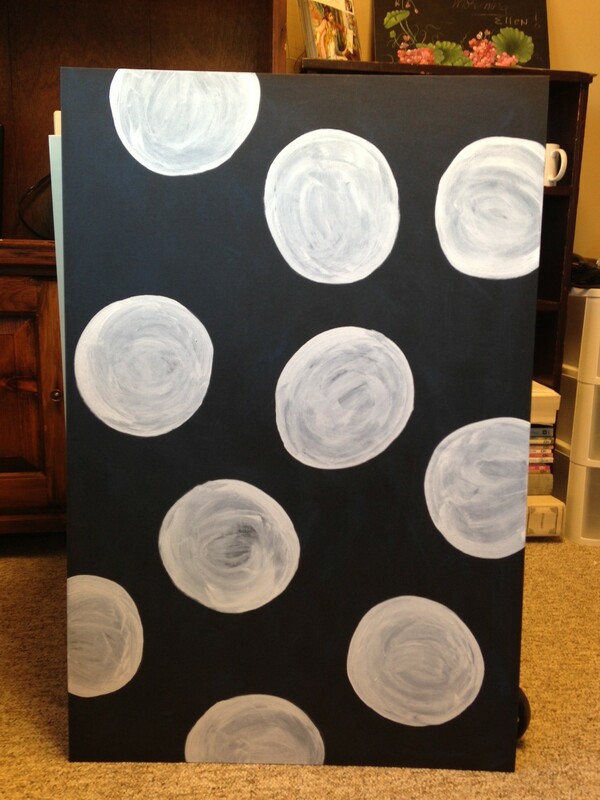 Step 4 – Starting in on the texture detail. Step 5 – Adding more detail. 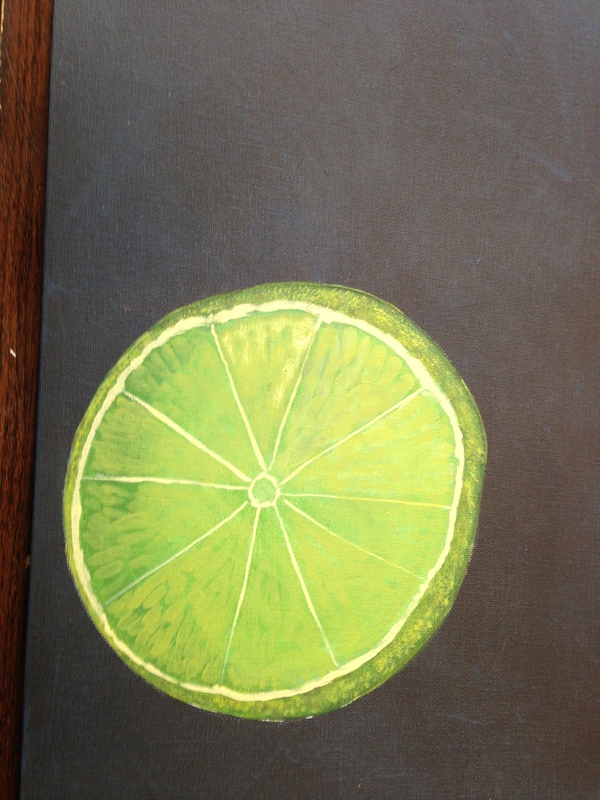 Step 7 – Finished lime! All done! Makes me want a cocktail! This is a commissioned piece for a bar in Hampton. 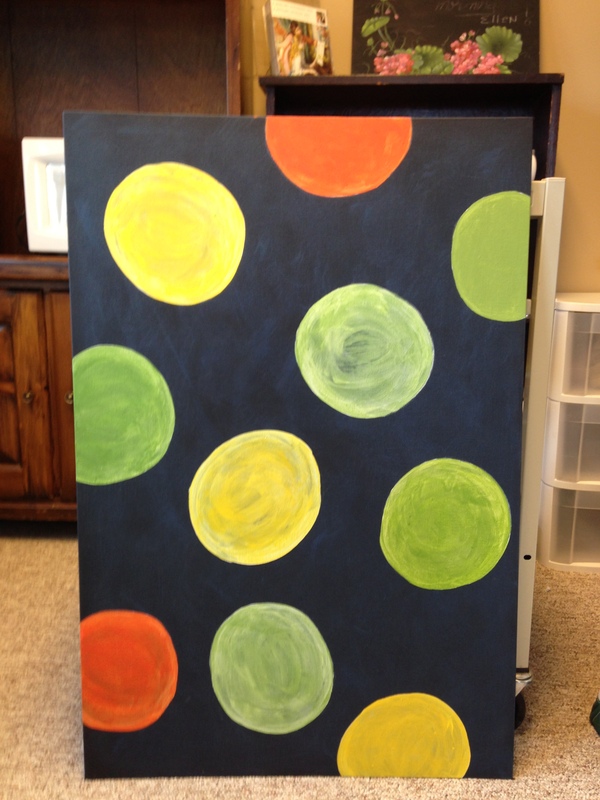 These three pictures show the progression of painting olives. The undercoated olives are in yellow. 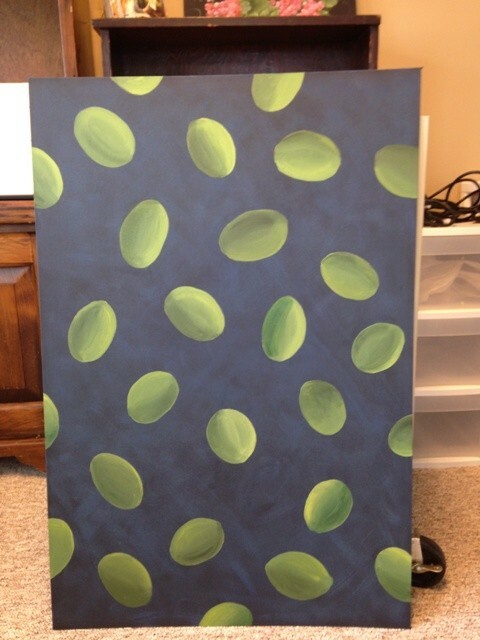 I then base coated the olives in various shades of green. 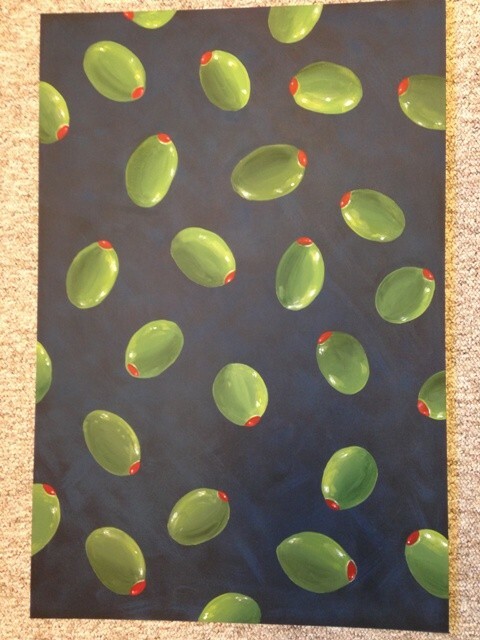 Then the final painting of the juicy olives. 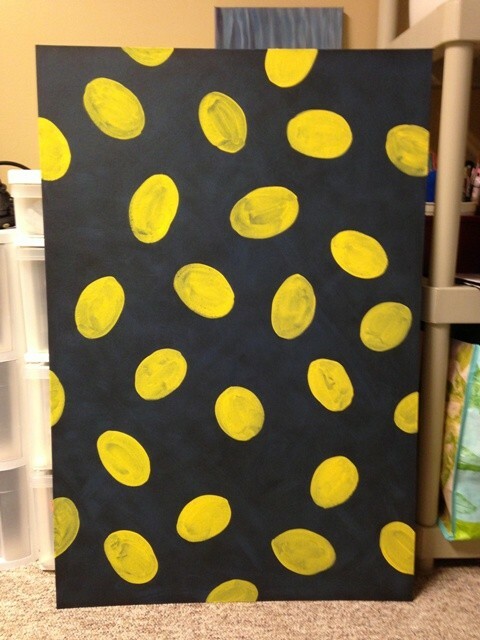 What can I say, “olive painting”! Under coat (first step) in yellow. 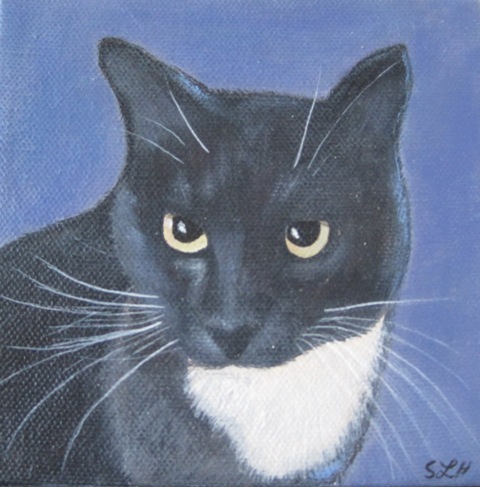 This is a second pet portrait I did after Sammy for another acquaintance. 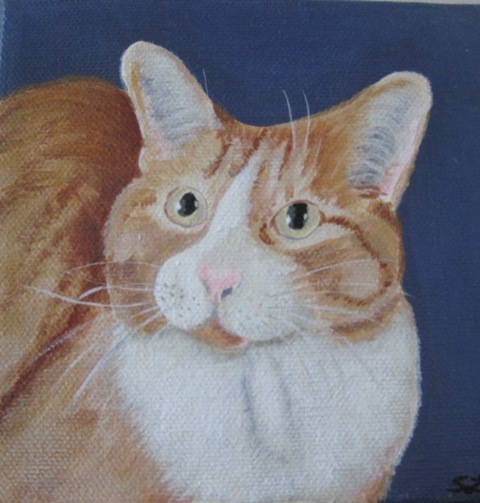 Sammy is an example of a pet portrait I did . She is my friend’s little Jack Russell Chihuahua mix. She is such a little lady . Love the pink collar. These paintings are of an awesome old truck at an antique dealership in Hampton, NH. I thought that they would look cool exaggerated with close-up detail. These were fun to paint.